Tabriz is one of the oldest and most beautiful cities in Iran. It is province of East Azerbaijan with an area of 1400 square kilometers. Population of Tabriz in 2011 was over 1,494,998 persons which by considering inhabitants in the suburbs will reach to 1,800,000. Tabriz metropolitan is one of the largest and significant cities in Iran and has major industries of countries and is considered the country’s third largest city after Tehran and Mashhad. This city that is limited northerly to Eynali Mountain, southerly to slopes of Sahand Mountain and westerly to plains of Tabriz and Urmia Lake leads to attract many tourists. It is located in the northwest corner of the Iranian plateau. Considering the mentioned geographical situation, East Azerbaijan enjoys considerable climatic variation so that in 50 days of year the weather is freezing and in the hottest hours of summer’s day in some areas; temperatures is above 40 °C. 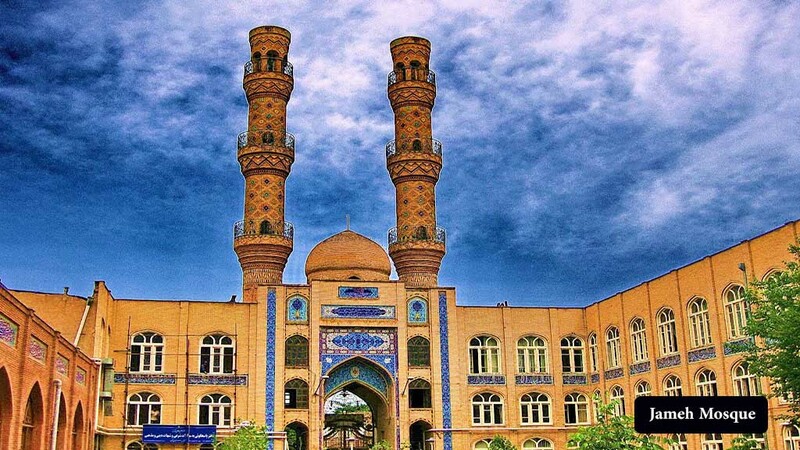 From ancient times, Tabriz was regarded by the kings and there are monuments to the multiplicity that some of them are mentioned here: architectural style, Timcheh plurality and plenty of schools and mosques that are often validated historically turned the Tabriz Market into the considerable markets of the Middle East. It is arguably one of the longest indoor markets of the world. Jameh mosque is of the ancient and historical monuments. During the Seljuk period, a new building was built on the foundation of this mosque and shaped a new form. However, previous works can be seen in this monument. Blue mosque is one of the buildings that has been built in the time of Abolmozafar Jahan Shah Ibn Qara Yusuf time from Turkomans of Qara Qoyunlu and has been completed in 1465 by efforts and supervision of Jan Begum Khaton, wife of Jahan Shah Ibn Qara Yusuf of Qara Qoyunlu. El-Golu Park is a beautiful and famous park known as Shahgoli or Estakhr-e Shah. It is considered as the most beautiful and attractive resorts of Tabriz which is located in Seven kilometers southeast of Tabriz on a hillside and includes a swimming pool with twostory magnificent mansion in it. The most beautiful and attractive wetlands of this city are Bozojeg-Golu in 50 kilometer of west of Hashtrod City which is a permanent wetland used by migratory birds; Yanig-Golu located in 31 kilometer of southwest of Hashtrod and is used by wild birds in autumn and winter; Mahiabad Wetland is located in 20 kilometer of Mianeh which is a seasonal wetland and has an agricultural use and while having high water is sued by migratory birds; Gobadlo Wetland is in 22 kilometer of northwest of Ajabshir, upward of Rahmanlo port and attracted some birds of marginal wetlands of Urmia Lake; Alma-Golu is in 2400m height and southeast of Sahand Heights with an area of 20 hectare. It is covered by reedy and aquatic plants and is appropriate for implantation of birds such as Mallard & Coot so it has recreational value. loge. Furthermore, the first modern translated plays from French and English, including works of Shakespeare & Lumiere were played here which was destroyed due to the Ottoman wars. Another work that shows the interest of people of Tabriz to art is establishment of the 1st printing office in 1848 by Prince Abbas Mirza. The next one was established 12 years later. Indeed, foreign books were translated in Tabriz for the first time. Peter the Great, Charles XII & Alexander the Great Books were translated in this city for the first time. The first public library by Mirza Hassan Khan Khazan Lashgar was established in 1933. The first cinema, 5years after world’s invention was established by Lumiere brothers in Tabriz in the name of Solli (Sun). While there was no photo in any cities of Iran and artists painted their works on canvas and walls of cities, the first gallery was launched by Qasem Mirza in Tabriz. 5 stars EalGoly Pars hotel of Tabriz started accepting guests on 20 March 2002. The main tower of El Goly Pars hotel of Tabriz with 17 stories has a revolving restaurant which has caused many local and foreign travelers to choose this hotel for their accommodation. El Goly hotel of Tabriz (Pars Tabriz) has 20 single rooms, 60 double rooms, 79 single rooms, 20 royal Suites with 140 m surface area. Revolving restaurant has 350 square meters of surface area and a unique perspective on the roof of the city of Tabriz. There is also a beautiful swimming pool, Sports Hall, lobby, numerous shops and stands and a coffee shop in this hotel which is located in a quiet and green area of Tabriz and created a cheerful and fun atmosphere for visitors. 5 star hotel of Shahriar is located at the beginning of Eal Goli road in Tabriz beautiful area of Tabriz. This hotel started it’s operation based on modernfacilities and equipment and international standard of hotel industry in the summer of 2007 and is nowready to welcome traveler from around the world. Other features of the hotel include: two Halls with a capacity of 800 people, swimming pool, dry and steam sauna, Jacuzzi and gym halls separately for ladies and gentlemen, a conference Hall and Auditorium Theatre, fast food, 24-hour r oom service, laundry, Bank, barber shop, cafe, restaurant, Halls, satellite, Internet, children’s playground, green spaces, roofed parking, Internet Cafe and game NET, shops and stores, free transport to airport, traditionalhouse tea, tennis court, billiard rooms, Hairdresser, urban and suburban taxi, urban and suburban tours, visiting historical monuments and tourist attractions and sights. or without Jacuzzi, four person rooms with Jacuzziand Royal suites. The historical and beautiful village of Kandovan is located 22 km far from Osku and 62 km from Tabriz in the midst of soaring mountains in the northern slopes of the volcanic mountains and the western part of Sahand and in the alluvial valley of tourism village of Kandovan. Many nomads are attracted to these grasslands.Pyramidal houses have rocky architecture and are very unique in their kind. The village has a mountain and country weather and dates back to the 13th century according to the investigations. Because of having houses like beehive (Kando) it is known as Kandovan. The village also has a soft and tasty mineral water which is among the most famous mineral waters in Iran. Shahid Madani International Airport of Tabriz (SMIA) is the largest airport in the North West of Iran. As far as SMIA is located on the borders of Iran Aviation corridors to Europe and Central Asia, it is consequently considered of utmost importance. SMIA is considered the country’s third largest airport in terms of number of passengers. It is situated in the North West of Tabriz metropolitan. The airport is situated at an altitude of 1,494 meters above sea level and is located on 420 acres. It was launched 57 years ago and with roughly 200 domestic flights and 20 international flights on a weekly process, it’s suitably ranked highly amongst Iranian airports of incoming and outgoing flights as well as navigational equipment.